A famed Italian Catholic cathedral organist is believed to have been the first Western musician to perform in Syria since the start of the civil war nearly six years ago. “It has been awesome. It was something unbelievable,” Eugenio Maria Fagiani told Catholic News Service by phone of his recent performances in the Syrian capital, Damascus. “It has been a great privilege to make music with people so passionate, so full of life and joy,” Fagiani said of the camaraderie shared with members of the Syrian National Symphony Orchestra and its maestro, Missak Baghboudarian. Together they performed Joseph Jongen’s “Symphonie Concertante” and Camille Saint-Saens “Symphony No. 3” at the Damascus Opera House 9 February. “I chose these pieces (because) they make people feel really joyful,” Fagiani said, remarking of the 1,100-person packed audience. The concert was recorded and is expected to be broadcast in Syria. The following day, Fagiani played at St. Anthony’s Latin Church in Damascus, at the invitation of Cardinal Mario Zenari and the parish priest, Father Fadi. Both concerts initiated the first Syrian Pipe Organ Festival, sponsored by the Franciscan Custody of the Holy Land. A native of the northern Italian town of Bergamo, Fagiani is formidable in the world of international sacred organ music and is recognized for his composition and improvisation. In Italy, he collaborates with the Orchestra Sinfonica di Milano Giuseppe Verdi and is also the cathedral organist in the town of Arezzo, especially playing services during which a bishop or archbishop presides. He regularly performs in Europe, the U.S. and Canada. Initially, Fagiani was concerned about traveling to Syria, especially with its security situation as reported in the media. For that reason, he said, he did not inform his loved ones about the trip. But he soon discovered Damascus to be calm and quite tolerant, he told CNS. When he slipped into a large mosque for a visit, “nobody looked at me strangely,” he said. “I walked easily in Damascus without any problems or danger. There are a lot of checkpoints, a lot control, but you feel safe in that way,” he added. However, in other parts of Syria, government troops and rebel forces of various political stripes are engaged in heavy battles for the country’s future. The United Nations said the conflict has killed more than 300,000 people and displaced almost half of the Syrian population. The U.N. said another 600,000 people remain under siege by both by the Syrian military and rebel and jihadist groups. Fagiani said he found that the devaluation of the Syrian currency coupled with high prices for fuel and other goods as well as electricity shortages have made life even for Syrians living in Damascus more difficult. The concerts were co-sponsored by Syrian Culture Minister Mohammed Al-Ahmed, the Damascus Opera House and the Higher Institute of Music in Damascus. Fagiani has also performed at various church-organized organ festivals, including in Egypt, Lebanon and Jordan. Last October, he played at the reopening and dedication of the Memorial of Moses at Mount Nebo, Jordan, the site where Moses is believed to have seen the Promised Land and died. Volunteers, many of them Muslim, help to repair a Chaldean church damaged by ISIS in Mosul. Cardinal Timothy M. Dolan greets displaced Iraqis after the eucharistic liturgy in Erbil. One of the more energetic and visible advocates for CNEWA’s work among the persecuted and the poor has been the archbishop of New York, Cardinal Timothy Dolan. His support has been tireless and, indeed, heroic. In his capacity as CNEWA’s chair, the cardinal has visited a number of regions we serve, to meet those who are facing challenges and difficulties far removed from his work in New York City. Just last year, he traveled with CNEWA’s president Msgr. John E. Kozar and Bishop William Murphy of Rockville Centre to Erbil, where he met some of the Iraqi Christians who have been displaced by ISIS — men, women and children who have been literally running for their lives. What I saw was this blend of terrible sadness, and yet amazing charity and hope. Sadness, because these people who had come from Mosul or the plains of Nineveh — their families go back centuries and centuries, some to the time of St. Thomas the Apostle — had to abandon their homes in a couple of hours’ notice and couldn’t bring anything. They brought their children, obviously, and they brought their elders. The priests and nuns accompanied them on the [10-hour] walk, and they made it safely there. All these people want to do is go back home. What’s hopeful is that they still have an extraordinarily vivid faith — their resilience is nothing less than profound. What’s moving as well is the remarkable charity and hospitality with which the Christians of Kurdistan have welcomed them. So, we toured a number of camps. There would be thousands of these people in the refugee camps, which are actually rather secure and safe and where the local Christians have opened up schools, medical dispensaries and pharmacies. The people there will be the first to say that they are well taken care of — so, thanks be to God — because of a lot of international Christian support, and, yes, some support from the Kurdistan government and the Iraqi government. At least they have these secure makeshift caravans, which we would call “trailers,” to live in. And the camp seems to be secure, and their needs and health and food are taken care of, as well as the education of their children. So the charity that has been shown them is remarkable. “Pope Francis keeps saying that we priests must be with our people,” Cardinal Dolan said in his meeting with seminarians. “We just came from a refugee camp where we met a priest who slept outside on his mattress because he said he couldn’t sleep inside if his people were outside. That closeness to people is emblematic of Cardinal Dolan’s priesthood. And again and again during that visit, it was striking to see how eagerly he embraced those he met — and how joyfully the people in the camps reached out to embrace him and make him feel welcome. In the true spirit of CNEWA, he seeks to accompany others in their struggles, sorrows and hopes. No. 2, we learn the importance of solidarity. This is the lesson of St. Paul in Corinthians come alive: When one member of the body suffers, all suffer. So we are suffering with them, and we cannot be callous to their suffering. So that solidarity is a second lesson. Two young men take a break in the wood workshop of Caritas Georgia. To learn more about the skills being developed at Caritas, read A Letter from Georgia in the current edition of ONE. Members of Free Syrian Army encounter a flock of sheep in Aleppo during ‘Operation Euphrates Shield’ on 10 February 2017. A study released Monday says Syrian helicopters dumped banned chemical weapons on residential areas of Aleppo last year. This morning, we received an email our regional director in Ethiopia, Argaw Fantu, with some welcome news about an institution CNEWA has long supported, the Shashemene School for the Blind. During the past year, we had enrolled 96 students in the Residential School. (46 girls and 50 boys) from Grade 1 to Grade 6. In addition we had about 50 students in high school and college level who received support. The newcomers included some exceptional cases. Two girls whose mental capacity was very low had to be trained with all the basic day-to-day activities. Slowly they are trying to do things on their own. We have a new store keeper, and for the coming year we will have an academic director and other new staff. After several trips to Addis Ababa, we managed to get some Braille text books in English and Civics. One can imagine how delighted the children were to run their fingers though the pages of their new books. ...Woletebihan Wolde, the boys’ child care taker, retired after 35 years of dedicated services. As a token of our appreciation for her services the administration and the staff gave her a loving farewell. Thank you and God bless you, Woletebirhan! ...We look with joy to those who completed their studies and are ready to take up a job. There are four with diplomas from teacher training colleges and six with degrees from Addis Ababa and Awassa University. Meanwhile there are new entries into institutions of higher learning, giving us fresh hope. These will take four or five years before they can take up a career. The Government is accepting and employing the blind, when they are qualified, respecting their rights and giving them equal opportunities. It is amazing to see how the blind make their way through life. “I can do all things in Him, who strengthens me.” These words of St. Paul can very well be applied to them. To learn more about the school and its wonderful work, visit this link. And to discover how you can support the school’s mission, visit this giving page. CNEWA’s national director in Canada, Carl Hétu, last week published a reflection in the Canadian edition of Huffington Post. The topic: violence and the quest for peace in the Middle East. On a daily basis, the news is saturated with reports of violence around the world. Although it wasn’t covered widely in Canadian media, in recent months, a Canadian tourist, along with 13 Jordanians, was killed by terrorists in Karak, Jordan. According to reports, the terrorists’ real plan was to attack the local Catholic Church on Christmas Day. As Canadian National Director of the Catholic Near East Welfare Association, I visited Jordan in January. There, I joined a small group of Catholics and Muslims deeply shaken by this event to pray where the Canadian tourist was killed. The question on everyone's mind was: Why? Why did six young men from the Karak region decide to join the Islamic State and attack their own families, friends and neighbours? This is a first in Jordan, the most peaceful country in the Middle East. On other trips I took this past year to the region, I also met Muslims and Christians from Gaza, Syria and Iraq who have experienced the worst atrocities imaginable. They, too, ask: why? Back in Canada, the shooting at a mosque in Quebec City was a rude awakening, as the violence we see unfolding far away is now too close for comfort. Ironically, these victims came to Canada to escape violence and to live in security and freedom. On January 30, I joined 300 Muslims and Christians who gathered at the Gatineau mosque. At the invitation of Archbishop Paul-André Durocher Catholics and Muslims started talking to each other — embracing, shaking hands and some even hugging — to find human beings that needed one another in this time of crisis. Once again, people asked why. The reasons are multiple and complex, but at the root of it all, our world has changed in the last 30 years and we face many unresolved issues. German Cardinal Rainer Woelki of Cologne celebrates Mass on 12 February at the Church of Loaves and Fishes in Tabgha, Israel. Twenty months after having suffered serious damage from an arson attack, the atrium of the Benedictine church was reopened. Twenty months after having suffered serious damage from an arson attack, the atrium of the Benedictine Church of the Loaves and Fishes was reopened on 12 February. German Cardinal Rainer Woelki of Cologne, president of the German Association of the Holy Land, celebrating a Mass to mark the event. Israeli President Reuven Rivlin, who visited the church in Tabgha immediately following the attack in June 2015, was also among the official guests after the Mass. “We are bound together. We are all equal before God, and equal before the law,” Rivlin said. “The state of Israel is ... deeply committed to the freedom of religion and of worship for all religions and believers. We stand up for religious freedom because, as a people, we know very well what it means to suffer religious persecution. And we stand up for religious freedom because we are a democratic state. Noting the importance of preventing such attacks in the future, the guests spoke of the need to create connections among people of different faiths and to learn about one another. Two suspects have been held under administrative detention since July 2015 for involvement in the arson, which police are treating as a hate crime. Also known as the Church of the Multiplication, the church located on the shore of the Sea of Galilee is traditionally believed to be the site of Jesus’ miracle of the fish and loaves, where he was able to feed a multitude of people with only five loaves of bread and two fish. Although the Israeli government had made promises of funding to help restore the structure, the actual amount received for the restoration following yearlong negotiations was less than had been initially stated, according to Heinz Thiel, secretary-general of the German Association of the Holy Land. Israel contributed $394,000 toward the reconstruction of the church. Ultimately the work was completed through the help of private donations from both institutions and individuals, Thiel said. The total cost of the reconstruction, including loss of earnings and goods from their gift shop and the new security measures that had to be installed, was $1.38 million, said Benedictine Father Basilius Schiel, prior of the Tabgha monastery. 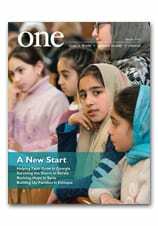 In the current edition of ONE, Journalist Diane Handal writes about how the Franciscan Missionaries of Mary are Welcoming the Stranger in Jordan. Here, she adds some additional impressions of the country and its people. The pink light was rising on the horizon above the hill filled with beige buildings crowded together with a street light sparkling here and there. This is the city of Amman. Two minarets stood guard in the distance to a huge mosque, named after King Abdullah, capped with a blue roof that looks like a children’s toy that spins. It is a memorial by the late King Hussein to his grandfather and the only mosque in Amman that openly welcomes non-Muslims. The city of Amman was waking up and the big blizzard they were bracing for never happened, but the plows were out there in the street. The Jordan Times was blaming the weather reporting for lost revenues. I arrived yesterday from the Allenby Bridge off the bus and into passport control, greeted by photographs of King Hussein, King Abdullah, and his son HRH Crown Prince Al-Hussein. My taxi had a big decal on the right side of the windshield of King Hussein. The driver was young and began pressing his foot to the pedal trying to pass the cars in oncoming traffic. I yelled, “LA, LA, LA!” He drove normally from then on. We passed little villages with stalls of red and white kaffiyehs, clear plastic life preservers for the beach, roasting chickens, the Jordanian flag of black, red, and green. Sheep were grazing on the hills and several makeshift tents appeared with children playing in the muddy street. I thought:poor Jordanians — or perhaps, refugees. A man was selling tomatoes in crates and garbage was strewn on the nearby land. Pouring rain beat against the windshield outside and the sky went black. The next day, I met with Sister Antoinette and the Franciscan sisters at the convent. It was evident how much they love their missionary work — these are giving, warm, smart, and selfless women. I met the Executive Chef from the hotel this morning at breakfast, Thomas Brosnan, who is Irish and I told him my son-in-law was from Galway. I was telling him how one of his staff almost electrocuted himself poking a knife in the toaster and I told him to stop and went behind the counter to pull the plug out. I wrote Thomas and asked if it would be possible to give the sisters some breakfast sweets tomorrow and explained the reason I was there. He said yes immediately, and was putting the pastry chef in charge. The next morning there were four huge boxes filled with breakfast sweets. The sisters loved them. I sent Thomas a photograph of the sisters at the table. Tamara, the photographer, and I had lunch in dining room with all the sisters. They take turns each day cooking. It was Sister Hanne’s turn today and we had fresh tabouli with romaine lettuce leaves, tunafish, French fries, pickled eggplant and cake for desert. Delicious! A young woman came to the convent with a white bag from a pharmacy. It had several pairs of eyeglasses in it. Sister Antoinette said it was for a little girl who is losing her sight and could not afford any. The sisters told me another little Iraqi boy had lost his hair due to trauma of the war. They said that the illnesses they see are mounting in both children and their parents. It makes sense considering what these families have been through and continue to go through. I walked with Sister Hanne to meet with an Iraqi family. She not only was jay walking, but walking in the street despite the lawless driving, using her cell while talking to me all the way. At the Iraqi family’s home, their youngest son had symptoms similar to autism and Sister Hanne hugged him and stroked his head, truly loving this child. It brought tears to my eyes. I left Amman and flew on Royal Jordanian to Istanbul. The flight was packed with elderly people who had just come from the Haj in Mecca, Saudi Arabia, and I don’t think they had taken a shower for days. The coughing was also widespread. Near me was a lovely Jordanian family with two small daughters. We all covered our faces with Kleenex and prayed that we would not get sick.